4 Bedroom Detached House For Sale in Chesterfield for Asking Price £375,000. This four/Five bedroom DETACHED attractively presented versatile family home offers spacious living accommodation throughout over two floors, having ample reception space, Four good sized bedrooms, en suite shower room & Two family bathrooms. 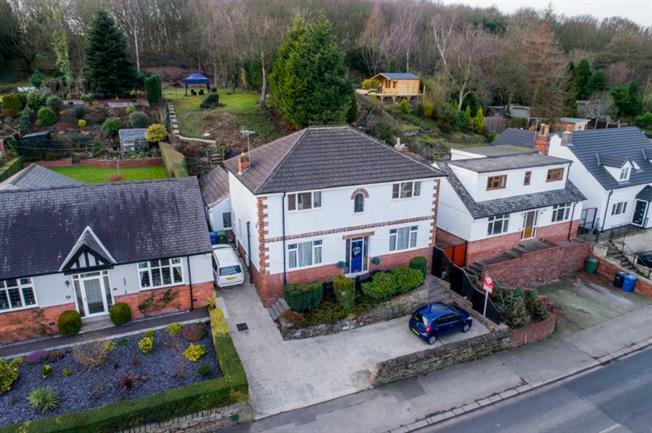 Benefitting from an elevated double width plot, laid mainly to lawn, leading into a sizeable area of woodland, providing far reaching views over Chesterfield & towards Bolsover Castle. The accommodation in brief comprises: front entrance porch, entrance hall, lounge with feature fireplace & French style doors accessing the rear courtyard, refurbished fitted kitchen complete with units from Howdens, including new hob, oven, sink with drainer and built in refridgerator, open plan to dining area, offering great entertaining space. Good sized utility room, leading to an additional versatile family room. A further sitting room provides a tranquil area for relaxation & the property also has the added benefit of a ground floor bathroom making easy access for young children from the large rear garden. To the first floor landing are four good sized bedrooms, a family bathroom & the master bedroom having an en suite shower room. Externally: To the front of the property a driveway provides off road parking, whilst to the rear of the property is a courtyard area with lighting offering a Mediterranean feel. There is a store room convenient for the outside storage. Steps lead to the larger than average rear garden which is mainly laid to lawn, boasting fantastic views. Located in New Whittington: a small suburb approximately 4 miles from Chesterfield Town Centre. With a host of local amenities it lends itself perfectly to family life. Excellent commuter routes via A617 to Junction 29 of the M1 motorway network along & within easy reach of Chesterfield railway station providing easy access to Sheffield, Derby & Nottingham.